Beautifully engraved certificate from the Dillingham Corporation issued in the 1970's. 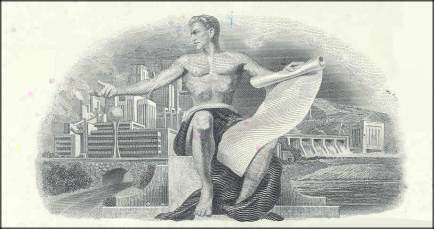 This historic document was printed by the American Banknote Company and has an ornate border around it with a vignette of an allegorical man sitting between a dam and a city. 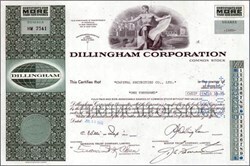 This item has the printed signatures of the Company�s President (Dillingham) and Secretary and is over 25 years old. The tenacious, can-do spirit that has become the Dillingham trademark can be traced to a time more than 100 years ago when a young sailor named Benjamin Dillingham dreamed of building a railroad across the swamps of the remote Hawaiian outpost of Oahu. Nicknamed "Dillingham�s Folly" and ridiculed by locals, Dillingham�s vision prevailed and the railroad became a reality. This success gave birth to the first of the Dillingham companies and provided fuel for subsequent business ventures. During the next century, Dillingham successfully merged with several formerly independent companies to expand our capabilities and serve the construction needs of diverse markets. For several decades, these operating companies have successfully collaborated on projects, pooling resources to bring in additional expertise in specialty areas of construction to achieve cost-effective and timely project performance. The major operating companies of Dillingham Construction Corporation are Dillingham Construction International, Inc., and Dillingham Construction N.A., Inc. in Pleasanton, California; Hawaiian Dredging Construction Company, in Honolulu, Hawaii; Nielsen Dillingham Builders, Inc., in San Diego, California; and Watkins Engineers & Constructors, Inc. in Tallahassee, Florida.